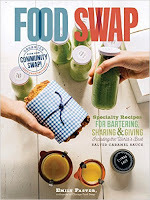 The June Chicago Food Swap will take place in June 29 at 3 pm. I am very excited to announce that our host for the June swap is the Sur La Table store at 900 N. Michigan Ave. I'm certain that everyone is familiar with Sur La Table, one of the premier kitchenware stores in the country. In addition to having an enormous selection of cookware, kitchen tools, small appliances, cutlery and tableware, Sur La Table stores also offer many different cooking classes. Ali Banks, who is the resident chef at the spacious 900 N. Michigan store reached out to me about hosting a swap at the store and I was thrilled at the idea of collaborating with such a prestigious partner. Sur La Table will be offering a small discount to all the swappers on the day of the swap so leave plenty of time for shopping! For those of you not familiar with 900 N. Michigan, it is a large shopping mall at the north end of Michigan Avenue. The mall and the Sur La Table store will be open at the time of the swap, so expect crowds. Parking in that part of Chicago can be challenging or expensive if you park in a garage. Consider taking the El or carpooling with other swappers. For the June swap, we will have the use of the in-store kitchen as well as the open space in front of the store. This should allow us to accommodate up to seventy swappers. Because of the nature of this space, however, no alcoholic beverages will be permitted, so please leave the home brews at home. Fortunately, with summer upon us, there are some many wonderful seasonal ingredients with which is make your swap items. Registration for the June swap is now open on Eventbrite. Because of the large size of this swap, it is free to register. I suspect that we will sell out so be sure to snag your ticket early. See everyone there!